At Vespers, yesterday morning, the antiphons Isti sunt sancti etc (not doubled) were sung with psalms 109, 110, 111, 112 & 115). From the chapter, Fratres: Estote imitatores Dei etc, the Office was of the Sunday and the hymn was Audi benigne conditor was sung. 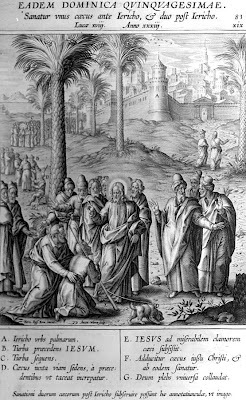 After the collect of the Sunday a commemoration was sung of the preceding Office of the Holy Forty Martyrs followed by the Suffrages of the BVM Sancta Maria succurre etc, the Apostles Petrus Apostolus etc, of the Patron and lastly for peace Da pacem Domine etc. At Compline the Dominical preces were sung. The Second Sunday in Lent is of semi-double rite. No feast can take precedence over it or any such a Sunday. 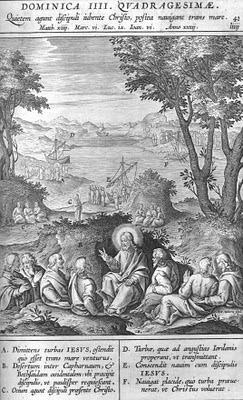 The Gospel pericopes are St. Matthew's account of the LORD's Transfiguration. At Vespers the antiphons and psalms are of Sunday (109, 110. The Office hymn is Ad preces nostras deitatis aures. After the collect of the Sunday the Suffrages of the BVM Sancta Maria succurre etc, the Apostles Petrus Apostolus etc, of the Patron and lastly for peace Da pacem Domine etc are sung. After Vespers of the Sunday Vespers of the Dead are sung. At Compline the Dominical preces are sung. The First Sunday in Lent is of semi-double rite and its liturgical colour is violet. No feast can take precedence over it or any such Sunday. 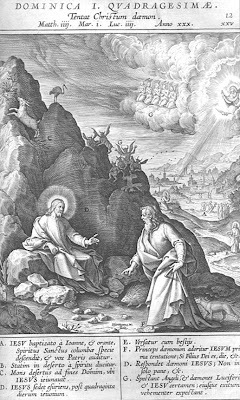 The Gospel pericopes at Mattins and Mass are St. Matthew's account of the LORD's temptation by Satan in the desert. The feast of St. Matthias the Apostle is transferred to Monday. At Vespers, yesterday morning, the antiphons and psalms (143, 144, 145, 146 & 147) of Saturday were sung. The chapter was proper to the Sunday and the Office hymn was Audi benigne conditor. After the collect of the Sunday the Suffrages were sung of the BVM Sancta Maria succurre etc, the Apostles Petrus Apostolus etc, of the Patron and lastly for peace Da pacem Domine etc. At Compline the Dominical preces were sung, with the choir standing. The blessing of Ashes and Mass follows after the singing of None. (Where the Expulsion of Penitents takes place the Ashes are blessed and imposed on the Pentitents followed by the Seven Penitential Psalms and Litany and the Expulsion of the Penitents.) The celebrant vests in a violet cope with the deacon and subdeacon wearing violet folded chasubles. The organ is silent following the general rule when folded chasubles are worn. 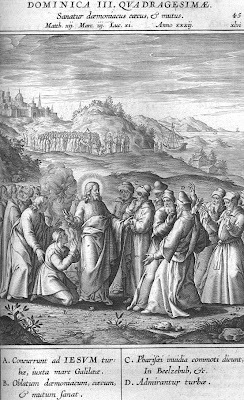 The Ashes, made from the preceding year's Palms, are blessed with four collects of blessing. The short conclusion of these prayers probably indicates the blessing was separated by the Expusion of Penitents from the Mass which follows. The Ashes are imposed whilst two antiphons are chanted Immutemur habitu and Inter vestibulum. These are followed by the poignant responsory Emendemus in melius. The Mass that now immediately follows is proper. The Gloria is not sung. 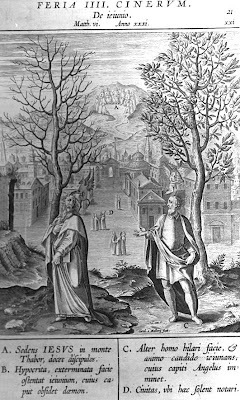 The second collect is of SS Perpetua and Felicity, the third collect is A cunctis. The preface of Lent is sung. The ferial tones are used for the orations, preface and Pater noster. The choir kneels for the Orations and from the Sanctus until Pax Domini. After the last collect the deacon sings Humiliate capita vestra Deo and the celebrant sings the Oratio super populum. The dismissal is Benedicamus Domino, sung by the deacon facing the celebrant and altar. At Prime the order of psalmody is Pss. 53, 92, 118i, 118ii and Quicumque, the 'Athanasian' Creed. The Dominical preces are sung. At all the Hours the antiphons and chapters are proper. Vespers are of the Sunday with psalms 109, 110, 111, 112 & 113. The Office hymn is Lucis Creator. After the collect of the Sunday a commemoration is sung of the following Office of St. Simeon followed by the Suffrages of the BVM Sancta Maria succurre etc, the Apostles Petrus Apostolus etc, of the Patron and lastly for peace Da pacem Domine etc. At Compline the Dominical preces are sung.